Hello everyone! It's my turn to post over at Twine It Up! with Trendy Twine today. This month, we are showcasing the 2x2 Craft Boxes and the newest Trendy Twine Colors. My color today is Creamy Pumpkin. I made some super quick and easy treat boxes to show you. These would be great to place at the table for Thanksgiving dinner and since I might do that, I kept them easy! To decorate the box, I cut a 1 inch strip of Orange Polka Dot Paper to wrap around the box. Next, I stamped the adorable pumpkin from the Hello Fall Planner Stamp Set on paper, colored it, and cut it out. This is pop dotted on the front of the box. I stamped the Give Thanks sentiment from the same stamp set on the top of the box. And then I wrapped my Creamy Pumpkin Trendy Twine around the sided and finished it off with a box. These are super quick and fun for Thanksgiving. 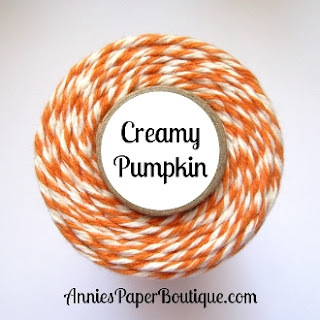 I hope you shop over at Annie's Paper Boutique for all your twine and packaging needs! So sweet and cute Helen! Your treats look so awesome! Love the adorable pumpkin band you created! Oh so CUTE Helen! Adorable Projects! Adorable, these stamps are so cute!